The eye is formed during embryonic development by a combination of head ectoderm and neural tube tissue, the neural tube tissue forming the retina. Thus, the retina is not a peripheral sensory organ (touch receptors), but an outgrowth of central nervous tissue. 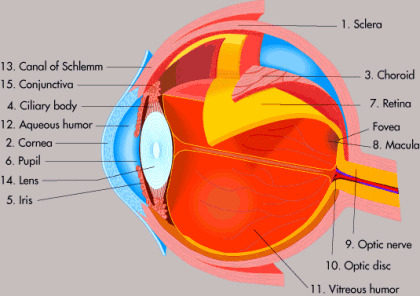 The retina has layers of neurons, internal circuits, and transmitters characteristic of the brain. In dim light, rods (outnumbering cones 120 million to 6 million in each retina) are used to interpret light as they amplify it. It only takes one photon of light to cause chromophore shape change in one molecule of rhodopsin in a rod. This is known as signal transmission. For transmission to occur, the initial tiny event must be amplified. The activated molecule of rhodopsin converts molecules of the next enzyme in the cascade to the active form, and this continues until the electrical potential of the cell membrane changes and the neurotransmitter release is affected. Cones, on the other hand, must each absorb hundreds of photons in order to send signals. In order to strengthen the image, many rod signal transmissions will converge and reinforce other signals (up to 150 may participate together). This sharpens the brain's ability to detect dim light. Cones are in control of our day vision and interpret color information. They are dispersed throughout the retina but are concentrated mainly in a central region called the macula, and even more so in the fovea. During the day the center of your eye is used to see objects. At night, the side of your eye is used to see objects. Cones have better spatial resolution than rods. Each cone in the fovea connects to only one neuron in the retina, influencing the ability to transmit fine detail, for activities like reading. Rods and cones may necessarily function simultaneously in dim or dark conditions. The colored part of the eye, known as the iris, is contrived of two muscles. The dilator muscle constricts the iris, increasing the size of the pupil and thus allowing more light into the eye. The sphincter muscle enlarges the iris, reducing the size of the pupil, and limiting light from entering into the eye. An individual's pupil size can change from 2 to 8 millimeters. As a result of the change in the size of the pupil, the eye can alter the amount of light that enters it by 30 times. During daylight hours, glare conditions can overpower and over-saturate both cones and rods. At night, it is primarily the rods that must respond to changes in light intensity. Our project is to reduce glare as it passes through the windshield, thus relieving these physiological responses.